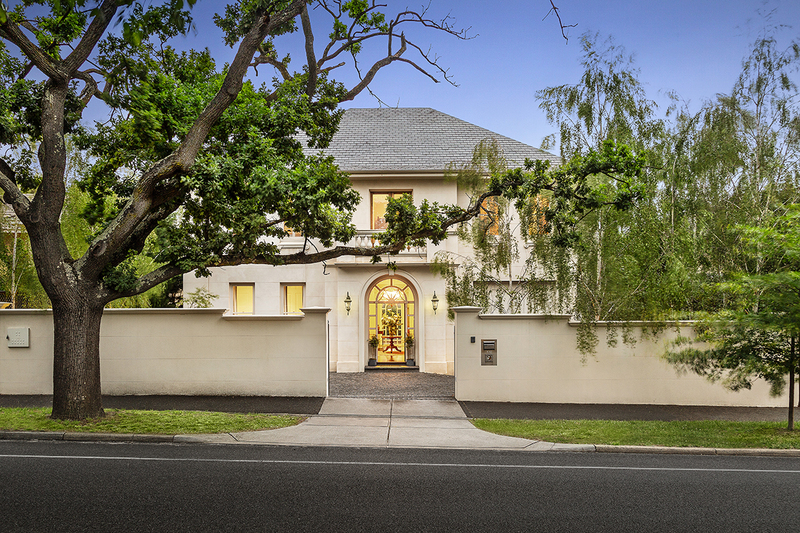 Reminiscent of a French chateau, regal elements and the highest quality fixtures and fittings combine with vast proportions and contemporary luxury in this magnificent family residence on the Golden Mile. A grand entrance hall sets the majestic tone where solid oak floors, doors and bespoke elements complement vast open living for the largest of families. Beyond compare, the great entertaining options begin in the substantial open plan family domain with an open fireplace and room enough for fabulous functions. The culinary kitchen centres on an enormous Caesarstone island bench, suite of Gaggenau and Miele appliances and a remarkable indoor/outdoor servery framed by a sliding glass window wall offering a restaurant setting to the glorious al fresco, manicure grounds and pool. A formal sitting room with courtyard access alongside the grand winding staircase, a guest bedroom with an ensuite, glorious fitted study, gym/art room and powder room complete the ground floor. Upstairs, the hotel-style main bedroom is enhanced by a balcony with picturesque views, fully fitted walk-in wardrobe/dressing room and a sumptuous marble ensuite with a bath completing the luxurious feel. Furthering the flexibility are four double bedrooms with walk-in wardrobes, an exceptional family bathroom with a bath, lounge room or possible sixth bedroom and another powder room. The enormous basement includes a sound proof music/games room and a six-car garage concluding with auto gates, ducted vacuum, C-Bus system, alarm, storage at every turn, surround sound, zoned ducted heating and cooling all in an enclave dotted with prestigious schools and near Maling Road shops, transport and parklands.